There is no universally recognized economic theory of cooperation. In this part of the book, we review number of the main issues highlighted in the cooperative literature. Benos, T., Kalogeras, N., Verhees, F., Sergaki, P., & Pennings, J. M. E., et al. (2015). Cooperatives’ organizational restructuring, strategic attributes and performance: The case of agribusiness cooperatives in Greece. Agribusiness: An International Journal, 5, 1–24. https://doi.org/10.1002/agr. Kahan, D. M. (2002). The logic of reciprocity: Trust, collective action and law. John M. Olin Center for studies in Law, Economics and Public Policy. Working Papers. Paper 284 http://digitalcommons.law.yale.edu/leep-papers/281. Nwankwo, U. M., Peters, K. J., & Bokelmann, W. (2009). Can cooperative membership and participation affect adoption decisions? Issues for sustainable biotechnology dissemination. AGbIOfORUM, 12(3&4), 437–451. Available on the World Wide Web: http://www.agbioforum.org. Petersen, S. B. (2004). Cooperatives and the EU enlargement. Federation of Danish Cooperatives, Agriculture Council of Denmark, 2004. Retrieved 8 January, 2007, from http://www.danskeandelsselskaber.dk/view.asp?ID=11940. Royer, J. S. (2004). 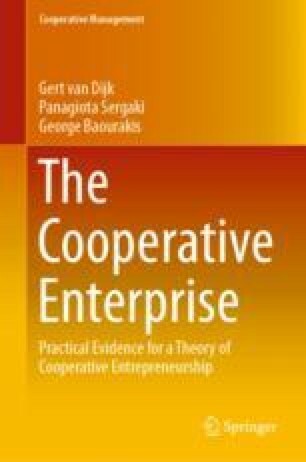 Cooperatives: An economic and management perspective. http://agecon.unl.edu/royer/theory.pdf.